Previous message: [IAEP] Found usb Microscope under $50 for XO! 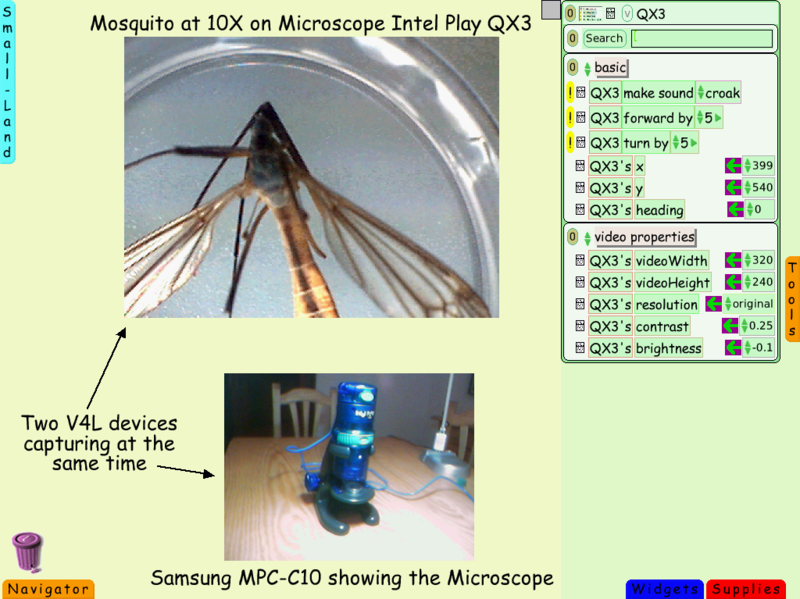 Next message: [IAEP] [support-gang] Found usb Microscope under $50 for XO! That screenshot is from the Spanish-language "Small-Land" version of Squeak/Etoys. It was created in Argentina and used for example in the 80,000 Linux PC deployment in Extremaduras, Spain. > I have one of these that I gave to my cousin! Let me see if I can just borrow it. > Since Pato Acevedo confirmed that the QX3 microscope works with linux and Etoys I decided to go ahead and get one from Ebay (total with shipping was about $25). It should arrive in plenty of time for SCaLE and for all of you to help me get it working! > While Mary Lou Jepson's jury-rigged lenses-to-microscope experiment sounds intriguing and inexpensive, I don't think it will meet the needs of real life students studying real life biological specimens. The only problem with the QX3 is that it is no longer made, so other choices would need to be found. This is mostly for proof of concept. > Thanks for all of your help and suggestions. I'll be back in about a week, full of "how to" questions. > Can we post this back to the lAEP? > But I don't think they are actually manufacturing them. I worked on a project to make an educational website that went with the microscope but I think they had quality problems with manufacturing and a business opportunity with disney and the microscope just wasn't a priority for the company. > The microscope used a propriety driver and software. Even if you get one off of ebay I am doubtful you can get it work on Linux. I don't think they ever got it working on a mac. > Has anyone tried an "Intel Play QX3 Digital Computer Mocroscope like this one on an XO? > It is no longer manufactured, but there are some available at ebay (as shown above). > I would really like to get some kind of usb microscope that could be used with the XO to have at SCaLE 9X at the end of this month and to explore features for the water/health lessons some of us are working on for Haiti. > Cherry Withers has ordered a microscope, but it is currently backordered and probably won't arrive in time for SCaLE. > Has anyone else used one with an XO? If so, what kind? Where is it available? Is it plug-n-play or do you need to install software? Anything else I should know? > I really don't want to use one that relies on the XO computer camera to function.